Thika United resumes training ahead of playoff duel. B.Badi on the ball vs Ushuru in 2016. Thika United FC has resumed training after a short recess following their 1-0 win against Bandari FC in their season ender match at Thika Sub-County Stadium two weeks ago. who finished in third place behind Wazito FC and Vihiga United who both qualified to be promoted for 2018 Kenyan Premier League (KPL) season. The two legged fixture will kickoff with Thika United playing hosts to Ushuru on Wednesday 6th at Thika Sub-County Stadium from 3pm,ENTRY FREE. The return fixture will be played three days later at Camp Toyoyo on 10th Sunday, kickoff 3pm. The winner of the playoffs will automatically secure a spot in the 2018 KPL season, with the loser to play in NSL 2018 season. Compiled by Ken_Magu. 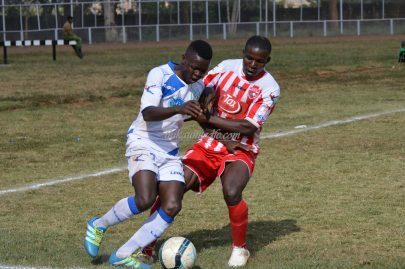 ← Thika United beat Bandari to evade drop.